The public will be the beneficiary of a new riverfront park, thanks to an agreement between Miami-Dade government and the developer of mixed-use River Landing Shops and Residences. County commissioners declared surplus county-owned land at 1280 NW 11th St. and authorized its conveyance to River Landing Conservation Foundation Inc., a not-for-profit, to create and maintain green space, seawall, landscaping, lighting and a riverwalk open to the public. 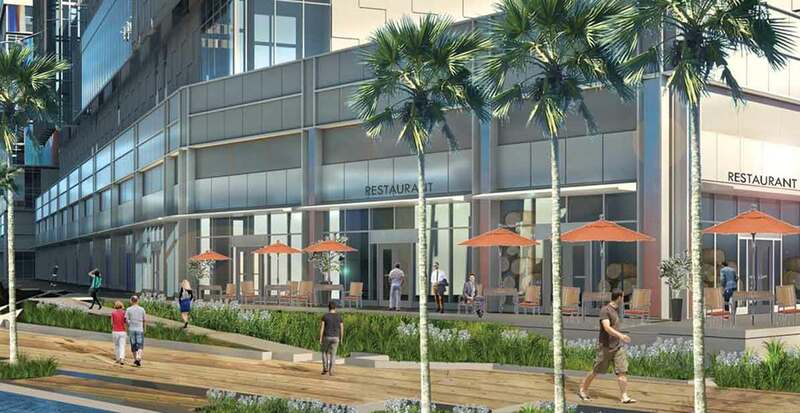 River Landing is planned for 1480 NW North River Drive near Miami’s Health District. It’s to rise on the site of former Mahi Shrine Auditorium, which was demolished last year. The 8.14-acre development is to include 426,000 square feet of retail and restaurant space, 475 market-rate apartments in two towers, and parking for about 2,200 vehicles. Andrew Hellinger, manager of River Landing Development LLC, formed the foundation in order to acquire and improve the county land. Today it is an aging parking lot used by the county, near Northwest North River Drive and Northwest 14th Avenue due east of the former shrine. The county’s resolution requires the foundation to spend at least $3,974,223 to improve and maintain the property, restricts site use and re-conveyance, and provides for a reverter at no cost to the county if conditions aren’t met to comply with the intent of the county commission. Earlier this year, Deputy Mayor Jack Osterholt told commissioners that staff decided to use a conveyance rather than a lease as the developer would be responsible for all improvements and the property would revert to the county if it wasn’t maintained to county satisfaction in perpetuity. The resolution conveying the county land to the foundation refers to enhancing the Health District. “It will help fill the district’s gap and demand for shops, restaurants and market-rate apartments. The Health District is the densest employment area in Miami with over 45,000 employees working around the clock in world-class research institutions, hospitals, medical schools, science labs and the court system. Our intent is to provide employees, residents and tourists a desirable place to live and visit and a new place to shop and dine,” Mr. Hellinger said. In March, the developer received $7.5 million from the county from an economic development fund. The developer requested the funds as reimbursement for infrastructure costs. In order to collect the funds, the developer must complete the project and prove jobs have been created.